Each includes an essential oil infused facial steam and soothing hand and arm massage to induce a state of dreamful relaxation. 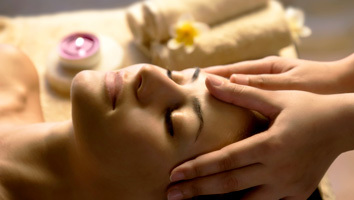 Luxuriously relaxing, yet highly effective, this is no ordinary facial – be prepared to glow! Cleanse, exfoliate, extract, mask, massage and hydrate… basic but never boring. Best suited for congested skin or skin that’s in need of a jump-start. Our most hydrating facial… plumps up, firms and tones… perfect for just before your next special event to look your very best. Just for him… no fuss, no frou-frou – just the essentials he’ll appreciate. This intensive clinical facial is designed to rapidly and safely resurface the skin, reducing fine lines and wrinkles, smoothing, softening and encouraging cellular renewal. The centerpiece of this remarkable treatment system is a combination of two therapeutic masques: the extremely powerful Intensive Resurfacing Masque (Fire) and the soothing Rejuvenating Masque (Ice). In addition to these masques, the incredible facial is complemented by a unique combination of serums and creams. Awakening your senses, this phenomenal system incorporates both active and soothing formulas which evoke aromas of warm cinnamon spice and brisk cool peppermint. Crystal-free microdermabrasion treatment reduces fine lines, hyper-pigmentation, minimizes pores and stimulates the production of collagen to give you back your glow. Everyone will “wonder” how you always look so refreshed and revitalized. Microcurrents stimulate epidermal circulation, restore muscle tone and deliver nutrients essential to the production of collagen and elastin.